A riveting account of ancient Rome's imperial bodyguard, the select band of soldiers who wielded the power to make - or destroy - the emperors they served. Founded by Augustus around 27 BC, the elite Praetorian Guard was tasked with the protection of the emperor and his family. As the centuries unfolded, however, Praetorian soldiers served not only as protectors and enforcers but also as powerful political players. Fiercely loyal to some emperors, they vied with others and ruthlessly toppled those who displeased them, including Caligula, Nero, Pertinax, and many more. 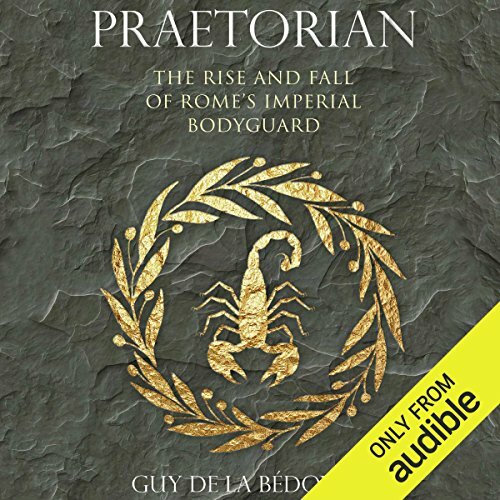 Guy de la Bédoyère provides a compelling first full narrative history of the Praetorians, whose dangerous ambitions ceased only when Constantine permanently disbanded them. De la Bédoyère introduces Praetorians of all echelons, from prefects and messengers to artillery experts and executioners. He explores the delicate position of emperors for whom prestige and guile were the only defenses against bodyguards hungry for power. Folding fascinating details into a broad assessment of the Praetorian era, the author sheds new light on the wielding of power in the greatest of the ancient world's empires. ©2017 Guy de la Bédoyère (P)2017 Audible, Inc.
To begin with, as the author states in the forward this is not a look at the Praetorian Guard at an individual level though a fair amount of this does take place in the guise of personal diplomas and tombstones but rather a broader look at the institution as a whole. From it's inception at the begining of the imperial age of Rome to it's downfall which coincidentally was brought on in part from the guard's own meddling in imperial affairs; this book follows the institution's course as it runs parallel to and often redirects the life of the Caesars they were meant to protect. The book is well written and spiced with allusions to other works both ancient and contemporary and may be more properly enjoyed if the listener has some previous knowledge of Imperial Rome. Exceedingly well read. 5 out of 5. When I read books about Rome I do not often learn anything. In this case I did. The author also does a great job of reminding me what might have happened, what we can't or at least don't know and why this matters. I went ahead and gave it five stars despite mispronunciations. I've lost hope in this regard. insightful story. narrator was wonderful, the tempo of narratio a little fast for me. good background to the broader histories and bio's. The central thesis of this book is that the roman empire was from its outset a military dictatorship, and that the true seat of military power lay in the hands of the praetorian guard. Unfortunately the author is robbed of a lot of power to slam this belief home by the lack of sources at crucial points in the story of rome, particularly when the empire changed hands multiple times over the course of a few decades. To sum up the story in total, when the empire's borders were secure, the praetorian guard held the most power, being a military force stationed within the city walls who had their own centralized leadership and fortified base of operations. When the borders came under threat however, and the limitations of a single ruler exposed the need for not only a warrior emperor constantly traveling but a fellow emperor based outside of rome, the praetorians lost their key leverage--proximity. They could no longer threaten the emperor's life. Because of their lack of power and potential for being swayed, they were eventually disbanded by Constantine. Is this a story worth telling? Of course. Should it take so many words? Of course not. Like many historical authors, Bedoyere uses excessive and long-winded phrasing--"In the extreme" rather than extremely, "not dumb" instead of smart, and "in the event," a phrase which has no recognizable impact on any sentence I've ever read other than to make the sentence three words longer. This makes the narrative a little hard to follow, but isn't as bad as his biggest failing: order of events. Until now I'd never read a book where the author will spend an hour telling you about a thirty-year civil war between characters whose names are only slightly different, and then at the end start describing the behaviors of an unmentioned character back toward the beginning of said war. Bodeyere has become the first. Enjoy listening to, for a made up example, twenty minutes about how Gordian III gave up power to Philip the Arab, another 20 minutes of how he gave up power to Philippus, and then a random ten minute diversion into the life of a senator whose actions will be described in detail until the author calls out randomly that he served under emperor Gordian II. "Wait isn't the current emperor Philipus? Don't you mean Gordian III? Why are you giving me this information now!? I've moved on from all the Gordians!" Aside from those issues, the book is good. Its little missteps are more annoying than deal-breaking. What may break the deal for you is your expectations. The Praetorians aren't nearly as cool as you might have imagined, and because of the lack of sources in the 2nd century, the author is forced to fill the time with fairly useless analyses of how exactly they dressed, what exactly they earned in salary, and what their particular marriage laws were, none of which is consequential to the overall story or his opening thesis besides in a minor way. That said, even though it feels long, it's actually quite short. Worth checking out the audiobook for under $20. Would not buy a print copy in any format, as my eyes would glaze over after every sentence. But as an audiobook it's a good enough satisfier of any curiosity about the praetorians, and a reasonable summary of the first 300 years of the emperial era for anyone like me who specializes in the republican era. Great telling of an important part of the history of Rome. Balanced overview of a complicated story spanning centuries. Very detailed and interesting account of Roman Praetorians. I would recommend for anyone interested in the subject. If you are interested in a reference book or to get about 3 hours of interesting stories and 8 hours of blah blah, then get this one. The narrator's delivery was bland and dry; although he did pronounce the names convincingly enough. After the first hour, I tried to return the book but Audible did not allow it so I slogged through it. It could have been much more interesting a story as the time and the institution was fascinating but it was SO BOGGED DOWN that it was hard to pull anything out of it to keep me interested. Sorry but I was very disappointed in the story as a whole. Like I said, if reading thesis papers are your thing, go for it!